iPhone 6 Plus BendGate: why is it driving people bananas? Four years after antennagate, we have a new Apple scandal on our hands: BendGate, or perhaps even BananaGate. It seems that if you so much as look at an iPhone 6 Plus in the wrong way it bends into something that even Bananaman might balk at using. You know it's a scandal when the Daily Mail picks up on it. "Thinner design and the use of aluminium metal causes the deform", it says, so it must be true. Leaving aside the obvious point that what "causes the deform" is an external force acting on the metal, not the metal itself, is there a problem here? Let's go with yes first. Given enough force, you can bend or break anything. You can bend an iPhone 5S if you sit on it, but not as easily as you can with an iPhone 6 Plus; that's because the Plus is both thinner and larger, so there's more buttock pressing on it and less phone underneath it. Rival devices are both thicker and made of plastic, so they're tougher still (although rival devices can bend too - there were reports of bending Samsung Galaxy S4s in 2013). That said, you still need quite a lot of force to bend an iPhone 6 Plus. The videos doing the rounds so far clearly show people giving quite a lot of effort to their phone-bending efforts, and the likelihood of an iPhone 6 Plus becoming a bananaphone in ordinary use is very low indeed. It certainly looks like it's being blown out of all proportion because Apple equals traffic. We even tried it ourselves, and after a day of sitting with the Plus in the most obscene skinny jeans we could find, we didn't notice any more curvature. 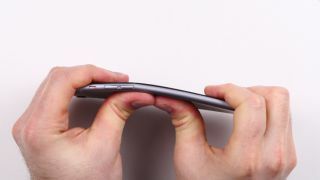 I do understand people's anger: you don't expect your really expensive phablet to bend in a pocket. But I'm also a bit confused, because it looks like Apple is getting it in the neck for making a phablet that isn't safe to sit on. Since when was that part of the spec sheet? Maybe it's just me, but as a 14-and-a-bit-stone man I try to avoid sitting on any of my consumer electronics because I suspect that it'll be uncomfortable at best and expensive at worst. I haven't sat on an iPad, my buttocks have never blessed my laptop and none of my parts have ever been plonked on a PC. If sitting on your phone matters to you, it's probably worth investing in some reinforcement. If it turns out that there's a manufacturing fault or a design flaw that means iPhone 6 Plus chassis may have well been made from butter then of course Apple has a case to answer, but right now it feels like the main culprit is the basic laws of physics.